He's back. He's in black. And he ain't talking no whack to you, Jack! Sure, he may lack the attack to hijack a snack. But at the end of the day, Daredevil is no quack. 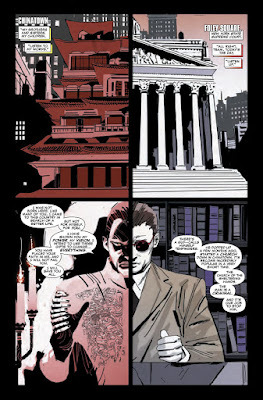 As seen in the following comic book created by Charles Soule, Ron Garney, and published by Marvel in January, 2016. TO QUOTE Ray Charles: 'How many times do I have to tell you? I don't know how many fingers you're holding up!"'. Hands up everyone who wants to know where Tenfingers buys his gloves from? Or for that matter, if he is able to stroke his own salami? What's that? None of you want to know these things? Alright then. Fair enough. It must be just me. Me, plus the rest of the weirdos who can't help but laugh at a villain who has a thing for... ahum... collecting fingers. Now please don't get me wrong, fellow DD doods. I'm not trying to say that I didn't like this issue or its main mischief-maker. If anything, I'm always intrigued by the concept of a shamanistic bad-guy who prey's on the innocent to further their own gain. In my book that's very Deacon Blackfire. Hands down! Ouch! You see, my main problem with Tenfingers is the fact that he has too many fingers. That, plus technically speaking he should be called eighteen fingers: Nine on each hand, minus the two thumbs. But still, I suppose this is just me being a bit too pedantic about something that shouldn't be griped about. And to be honest, the only real reason I mentioned this point, is because the rest of this issue was very-very good. 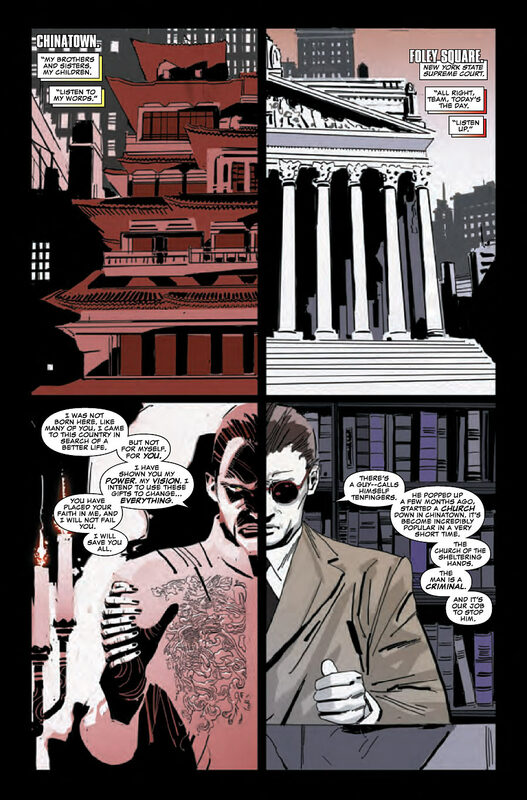 In fairly film noir fashion the story starts off by using a pretty nifty split-screen technique, relaying why Matt and his lawyer friends (or Tenfingers and his disciples) want to detain (or kill) the snitch Daredevil saved last issue, namely, Billy Li. Now in all fairness I must say that I did love the way these sections played out on the page. Not only because we could see both sides of the coin at the same time (so to speak), but on top of that, we also found out a bit more about Matt's new role, who he answers too now, as well as how the hierarchy is structured between Tenfingers and his cohorts. Once this section was finally relayed, completed, and played out (no spoilers here, folks), we are then presented with the aftermath of this initial section. An aftermath, I might add, which kind of felt anti-climactic in comparison. Almost as if the resolution seen in the first part of the story needed further reclassification. 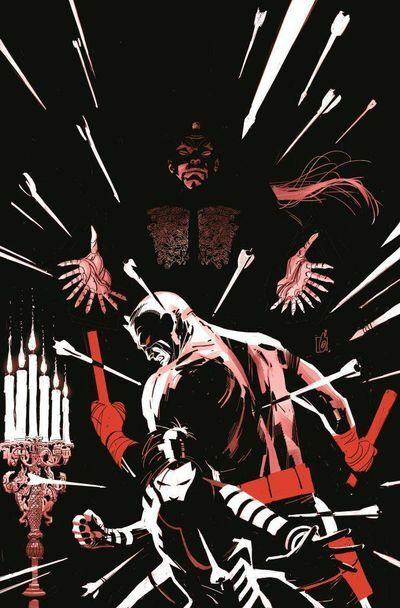 Again, please don't get me wrong, as I did enjoy reading the second part of this book as I did the first: Especially that scene where Daredevil's relationship with Blindspot was given more depth and dimension. But the thing is, the way the second part played out was as if certain people had to be at a certain location regardless of the issues plot heavy tone and slower pace, thus making it feel somewhat hollow by default. Something else about this issue I wasn't too sure of was that scene were Tenfingers disciplined one of his men for not doing as he was told. Was it just me, or is there more to this than meets the eye? From my point of view a kingpin doesn't just cave in so easily to a foot-soldiers reasoning. It would be like Darth Vader taking instructions from a Stormtrooper -- it doesn't feel right. Also, onto the art side of things and, yeah, that was alright too. I'm starting to get a hang of this new red, black, and white color pallet this book is conforming to. If I remember rightly, Detective Comics did a similar thing when Greg Rucker and Phil Hester took over that particular book. Plus I must admit, Ron's more bulky and Vertigo take on these characters allows them to feel more real than usual. Stylized, but real. So overall, good job, and let's see what happens next. Are you having a good day, comic book fans? I hope you are, because now it's going to get better as I'm musically matching up this month's episode with the theme tune to the KFC television commercial. 'And why would I want to do that?' you may ask. Simple really. It's because it's finger lickin' good. Back in the mid to late seventies there was a man called Jim Jones who gathered together a group of people who'd eventually worship him as if he were the next messiah. The problem with this though wasn't the fact that he wasn't the next messiah. 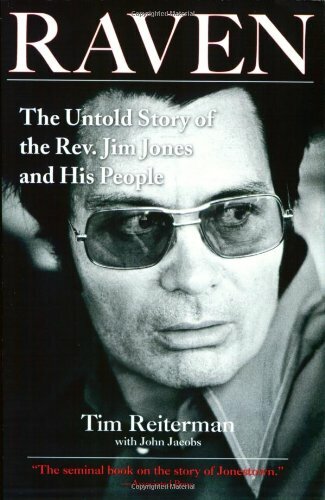 The main problem with Jim Jones is that he was a bloody nutter who led his people to a mass suicide in a place called Jonestown, Guyana. Mickey Mouse: Well, he only has three fingers. Homer Simpson: See previous answer and add one. Captain Hook: See previous two answers and take away a hand and add a hook. The Hand: What? Too obvious? Mickey Rooney: Small hands, a lot of alimony. Mister Handy from Fallout 4: All robot no hand. Walmart: You're mad I tell you. Mad! Donald Trump: See answer 1, 2, and 3, for more details, and then replace them with a wig.